The holiday season may feel like a distant memory, but for many, the repercussions of overspending on holiday purchases will linger well into 2019. If your credit card bill is making you feel stressed, you’re not alone. A recent report from Magnify Money found that consumers who took on holiday debt this past season racked up an average of $1,230. Although there’s not much you can do about your past spending behavior, taking action now to pay off your holiday debt can help you reach many other financial goals this year. 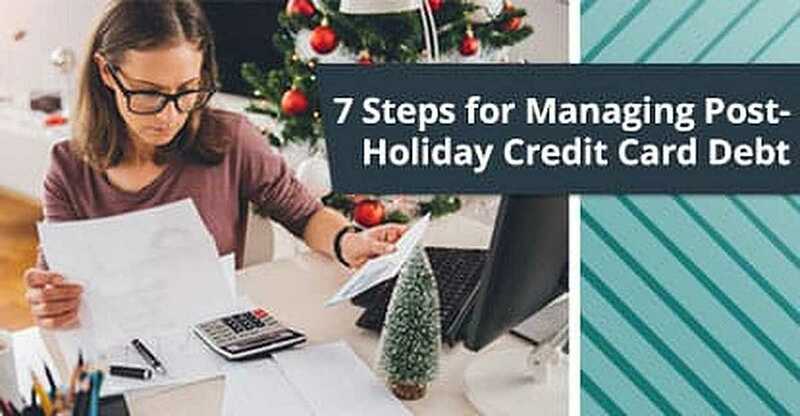 For those who need some help, here are seven ways to better manage your holiday debt and pay it off faster. Pretending credit card debt doesn’t exist may help curb anxiety, but avoiding your problem will just cause more stress down the road as the balance continues to grow. The journey toward paying down debt doesn’t have to be long and confusing. Set a clear path by identifying a goal you can realistically achieve. Pay more than the minimum balance due each month to get ahead of interest fees. To do this, organize your accounts to determine the damage done and figure out how much you can afford to put toward your credit card bill each month. Paying just the minimum due won’t get you very far thanks to interest fees, so always pay double to triple what’s due each month or, more if you have the extra cash, to really get ahead. If you scored an end-of-year bonus or raise, it’s time to put that extra income to work. Don’t waste your hard-earned dollars on meaningless purchases or fall into the trap of upgrading your lifestyle by purchasing a more expensive car or a bigger house. The best thing you can do with that money is to pay down any debts. Focusing on high-interest credit card debt from the holiday season now means you will have more financial freedom later. Plus, you won’t miss the extra income since you weren’t used to living with it before. For those who received a cash gift over the holidays, apply it to your credit card balance. This will ensure you avoid wasting any more money on interest, which is the best gift you could give yourself. Chances are you received a couple of gifts that just weren’t right. If you don’t know where these items were purchased, sell them online for cash that you can use toward crushing your holiday debt. Poshmark and Tradesy are great places to sell fashion, shoes, and accessories. You can post just about anything for sale on Facebook Marketplace, such as electronics, home goods, and toys. The site makes it easy to post items for sale using your phone and then chat with potential buyers about the sale using Messenger. Sites like Poshmark make it easy to sell unwanted clothes and accessories to help pay off debt. You can even sell gift cards you don’t plan on using at sites like Gift Card Granny, where you can get up to 95% of the card value. For anyone who purchased one too many gifts for themselves, it’s time to return those items you haven’t opened or used and get credit back on your account. When you have a limited income and tight budget, cutting expenses may not be enough to fast track your debt repayment. In this case, it’s important to boost your cash flow. If asking for a raise is out of the question, look for a side hustle that fits your schedule. For instance, you can find dog-walking opportunities at Wag! or babysitting gigs through Sittercity.com. You can also become a rideshare driver through Lyft or Uber and drive people around on the nights that you have nothing going on. Meanwhile, at Upwork.com, you can promote your professional skills to small businesses looking to hire freelancers. The opportunities to make some extra income are limitless! Look at your monthly spending to figure out where you can cut back over the next few months so you have extra wiggle room to put more money toward your debt. This may include canceling your cleaning service for a few months (and, get your whole family to share house-cleaning duties during this time!) or skip the salon and give yourself a mani-pedi to help save on costly beauty services. It’s also a good idea to review your bank and credit card statements for recurring expenses you can lower or do without. Look for ways to reduce your cable services by canceling premium movie channels or figure out if you’re overpaying on your mobile plan and ask about cheaper options. You may even be paying for subscriptions and memberships that you don’t really use such as a monthly beauty sample box or gym membership. Review your bank and credit card statements for recurring charges on items you can live without, like premium movie channels or an unused gym membership. Spending a few minutes to identify such leaks in your monthly budget can help you find extra cash that can be used toward paying down your debt faster. Keep in mind, you can always add some of these services or memberships back after you’ve paid off your credit card. Getting out of debt is similar to dieting: don’t expect to lose weight if you cheat on your diet and over-consume calories every weekend. When paying off your credit card bill, it’s important that you don’t take on any new, unnecessary purchases. Sure, there are the everyday things you can’t avoid buying, like paper towels and toothpaste, but beware of those impulse purchases. For daily staples, stick to cash when shopping and leave your credit cards at home so you don’t get tempted to buy something you don’t need. You can even take it to the extreme and freeze your cards in a block of ice if you need a better barrier! This is also a good time to reflect on your shopping habits to figure out why you got into debt in the first place. If you shop when you’re bored or when you’re feeling blue, look for other activities to distract you or boost your mood. For instance, go for a walk or call an old friend — these are healthier distractions for your mind and your wallet. Being able to visualize the progress you’re making paying down your credit card bill will do wonders for your motivation. To begin tracking, identify milestones you want to reach over the next couple of months, such as how much you would like to pay off and by when. These smaller, more achievable mini-goals will help you feel more successful and positive, and there are plenty of apps that can help you along the way. Tools like those provided by unbury.me can help you determine if the snowball or avalanche method of debt repayment is right for you. Check out unbury.me which offers a simple and straightforward calculator to help you determine how much you can realistically afford to pay off in a certain amount of time. There’s also The Debt Eliminator which suggests which debt repayment method is right for you — either the snowball or avalanche method. By reviewing your progress and realizing your success, you will feel inspired to continue working hard to pay off your lingering holiday debt.